This is to me one of the most unusual and interesting prophecies in the entirety of the scriptures. It is very easily overlooked because it is often overshadowed by the context surrounding it. This prophecy is important because it shows the omniscience of Jesus. Only God is all knowing. This verse then proves the divinity of Jesus. To get the full picture of this prophecy we need to look at its context. The verse that I am most concerned with however is verse 18. The disciples answered him by saying that some said He is John the Baptist, some said that He is Elijah, Jeremiah or one of the prophets. Jesus then asked the disciples, for all eternity, the question with the weight of the souls of men riding on it. “Thou art the Christ, the Son of the living God”. Praise His name, he is THE CHRIST, THE SON of THE LIVING GOD. This saving knowledge doesn’t come to us because we are so inteligent, it is imparted by God Himself. Isn’t He wonderful? The very knowledge that produces the faith that God demands is given by God to us. God is so good to us, His mercy is without ceasing. Hasn’t He been good to you? He has been so good to us. His love is without measure. While I was lost and undone, without God or His Son, Christ died for the ungodly. He died for you and me and He imparts this knowledge to us through His Holy Spirit. “And I say also unto thee, That thou art Peter (Petros), and upon this rock (petra) I will build my church”. Jesus here refers to Peter as Petros or a small stone, a pebble. Then He says, And upon this Petra, upon this Large rock, upon this foundational rock, I will build my church. Jesus draws a distinction here between Peter, the pebble and the Large rock that will be foundational for the church. What is this large rock, this foundation? Peter’s confession? In a way it is Peter’s confession, but it goes deeper than this. The foundational Rock is what Peter’s confession says. 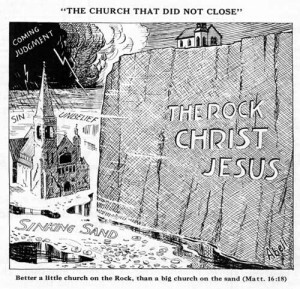 and even more to the point, the Rock to which Jesus refers to is Himself, the Church is built on Christ. No other foundation would stand the test of time. No other foundation would make the rest of His statement come to fruition. This prophecy has stood the test of time. Tyrants have shed the blood of saints and the church still stands. Scriptures have been banned by governments, but the church still stands. False doctrine has been the order of the day for several centuries at a time, but the church still stands today. False churches have persecuted the church of Jesus but God has always had a remnant. Through it all the church has held up that blood stained banner of the cross and has stood tall on its foundation, the Christ, the Son of the living God. We have plundered the gates of Hell to populate heaven. We have done this because of our foundation, Jesus Christ. He is the mighty Son of God. All hail the power of Jesus name, let angels prostrate fall!